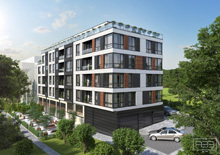 Buy in Bulgaria is selling new apartments in a suburban area of Varna, called Trakata. The construction is of high quality and the access is via an asphalt road. Various apartments are available, please, see the Price section for more details. Some apartments have sea view. The properties are offered ready for finishing works. The building is very well located, some 10 minutes from the sea coast, close to bus stops, grocery stores, school, kindergarten, bars and more. For more information, please, do not hesitate to contact us.